Sclerotherapy -- Salt water (saline) or a chemical solution is injected into the vein. The vein hardens and then disappears. Varicose veins are swollen, twisted, painful veins that have filled with blood. Phlebectomy -- Small surgical cuts (incisions) are made in the leg near the damaged vein. The vein is removed through one of the incisions. Varicose vein stripping -- Used to remove or tie off a large vein in the leg called the superficial saphenous vein. Vein stripping is surgery to remove varicose veins in the legs. Dalsing MC, Maleti O. Chronic venous insufficiency: deep vein valve reconstruction. In: Sidawy AN, Perler BA, eds. Rutherford's Vascular Surgery and Endovascular Therapy. 9th ed. Philadelphia, PA: Elsevier; 2019:chap 159. Freischlag JA, Heller JA. Venous disease. In: Townsend CM Jr, Beauchamp RD, Evers BM, Mattox KL, eds. Sabiston Textbook of Surgery. 20th ed. Philadelphia, PA: Elsevier; 2017:chap 64. Pascarella L, Shortell CK. Chronic venous disorders: nonoperative management. In: Sidawy AN, Perler BA, eds. Rutherford's Vascular Surgery and Endovascular Therapy. 9th ed. Philadelphia, PA: Elsevier; 2019:chap 157. The external structures of the heart include the ventricles, atria, arteries and veins. Arteries carry blood away from the heart while veins carry blood into the heart. The vessels colored blue indicate the transport of blood with relatively low content of oxygen and high content of carbon dioxide. The vessels colored red indicate the transport of blood with relatively high content of oxygen and low content of carbon dioxide. 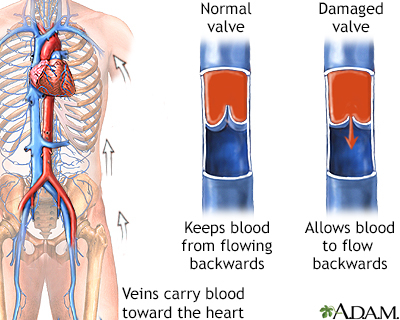 The valves in the veins usually channel the flow of blood toward the heart. When these valves are damaged, blood leaks and pools in the legs and feet. Venous insufficiency is a condition in which the veins fail to return blood efficiently to the heart. This condition usually involves one or more veins. Symptoms include swelling of the legs and pain in the extremities such as a dull aching, heaviness, or cramping.